Parents should see to it that their children are baptized within a reasonable period after birth. Arrangements for baptism should be made as soon as possible after birth, or even before birth. Once children have reached the age of reason, they would enter the Religious Education program to prepare for the sacraments of initiation, including baptism. 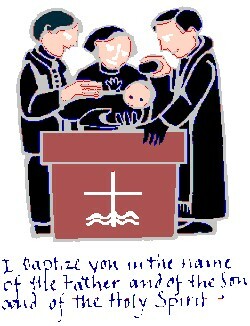 In Baptism, the Christian receives his/her name in the Church. This can be the name of a saint (who provides a model of charity and the assurance of his/her prayer) or it can express a Christian mystery or Christian virtue. See schedule below (please, no children). Check-in time is 5:45 pm. The class concludes at 8:30 pm. The materials fee for the class is $20 for each set of parents and includes follow up materials after baptism. At least one parent must be a Catholic—intending that the child become a full member of the Catholic Church (baptism-eucharist-confirmation). Complete Pre-Baptism Instruction Class and submit all required paperwork to the Rectory Office. Select a Baptismal Name for your child (which may be the same as the given name if it meets the requirements of a Christian name). Godparent must be a fully initiated member of the Catholic Church (Baptism-Eucharist-Confirmation), over the age of 16, who practices the faith. If they are married, their marriage must be recognized by the Catholic Church (ordinarily by taking place in the Catholic Church). A parent cannot serve as a godparent for their child. The godparents must also attend the Pre-Baptism Instruction Class (or a baptism class in their own parish). Obtain Baptism Registration Forms from Rectory Office or download a form from our website. After completing the Forms and attaching a copy of your child’s birth certificate, return them to the Rectory Office. Take time to prayerfully consider the selection of Godparents, knowing that their role is sacred. In addition to meeting the basic requirements, godparents are called to set an example for your child, help hand on the faith, and have a lifelong relationship of prayer, faith sharing and love. Attend Pre-Baptism Instruction (see schedule below). Once you have completed the Pre-Baptism Instruction and submitted all the necessary paperwork, you may schedule your child’s Baptism (see schedule below). All the sacraments are free, the same as God’s love for us. However, it is customary for families to offer a gift to the parish in thanksgiving for their child’s baptism. $100 is a suggested offering, but we are grateful for your generosity, no matter what your means allow. Your offering should be given at the time of your child’s Baptism. This schedule is subject to change. Please contact the Rectory Office (626-796-0432) to confirm dates. Pre-Baptism classes are held in “Upper Room.” Check-in time is 5:45 pm. Class concludes 8:30 pm. Please, no children.